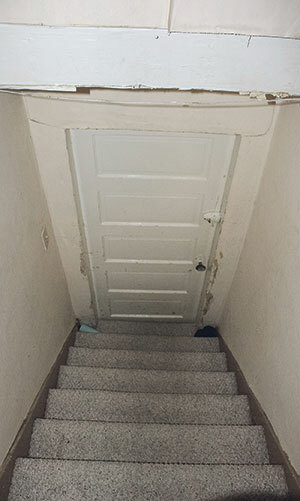 These stairs lead down to the door which separates Sam Fraser’s attic space from the rest of the house, which contains three other separate suites. Samantha Fraser is a student at The University of Calgary. She rents this attic suite inside a Mission house for $1,000 per month, which includes her utilities. It is one of four separate units in the house, where a total of eight people live. Her space also includes a full kitchen, bathroom, bedroom and living area. It’s about 500 sq feet and she found it listed on Kijiji. “It’s definitely a unique space and it goes to show you really can make any space your own,” she says, adding that she enjoys the intimacy of her small living area. 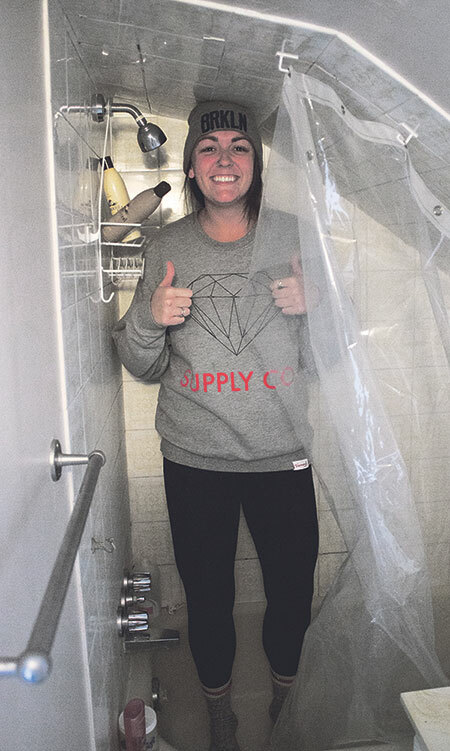 Fraser demonstrates the tiny size of the shower of her Mission secondary suite. A unique nook off of the kitchen area in Fraser’s attic apartment makes for a cozy place where she can read and drink coffee.